This is an easy and tasty pasta dish that’s sure to bring you comfort on a cold winter night. I had left-over tomato paste sitting in my fridge from a previous recipe and I wasn’t sure what to do with it. I first thought of making a simple tomato sauce but then I saw a can of tuna and couldn’t help myself to spice things up a little. This dish is quick, easy and delicious. Bon appétit! Heat a large pot of water. When it starts to boil, add some salt and the pasta. Cook for the time written on the package (around 8 minutes for shells). Meanwhile, sautée the diced onion in a pan with olive oil. 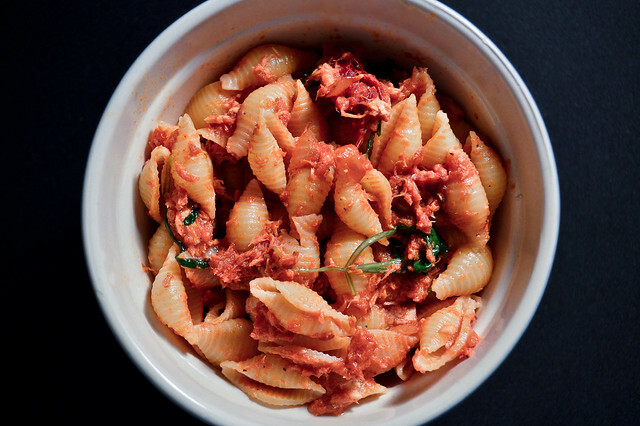 Add the tomato paste, sliced sundried tomatoes, chili powder, and a spoonful or two of the pasta water to the sauce. Stir well and let it cook for a couple of minutes. When the pasta is almost done, add the flaked tuna and the baby arugula to the sauce. Stir in order to incorporate all the ingredients together, and wilt the arugula. 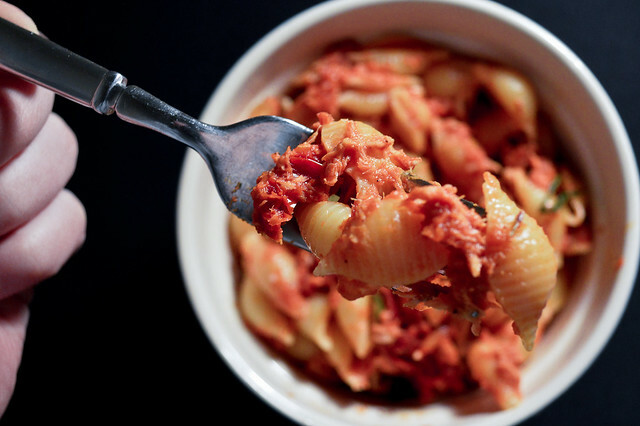 Drain the pasta and put it back in the pot, then add the tuna sauce and mix thoroughly. TIP: You can then sprinkle it with grated parmesan cheese! Spring can’t come soon enough! I’m sick of this weather, and sick altogether. This Polar Vortex has to go, and you won’t hear me say that often, but the snow has to stop! As I told you already, my favorite way to fight against the cold is to eat soup. 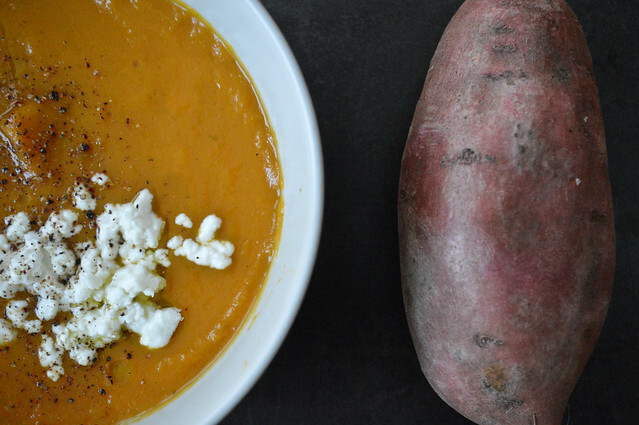 This sweet potato version is absolutely amazing and ridiculously easy to make. It’s slightly spicy and full of flavors. Bon Appétit! In a large pot, over medium heat, sauté the diced onion and spices in olive oil. Add salt and keep stirring until until they become slightly brown. Meanwhile, peal and dice the sweet potato. When the onion is nicely colored, add the diced sweet potato and the 3 cups of vegetable broth. Bring to a simmer and let it cook for about 25 minutes, or until the potatoes are tender. 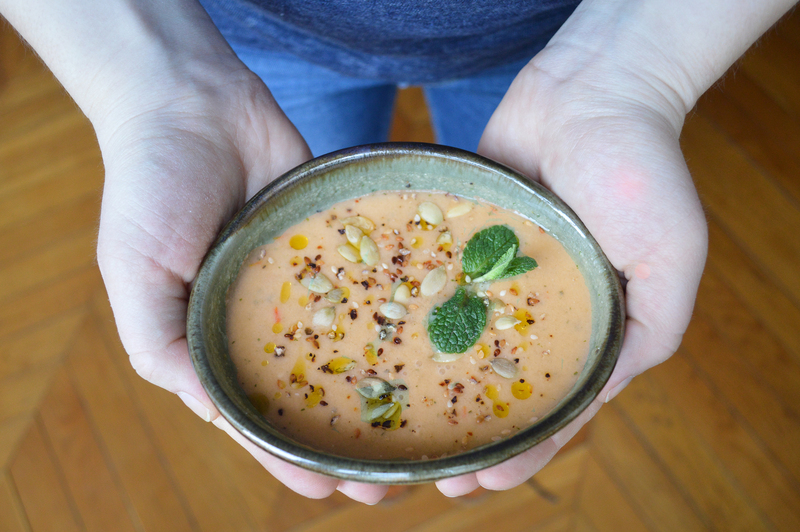 With and immersion blender, puree the soup together, adjust the seasoning and serve immediately. TIP: you can add any toppings you like: roasted sunflower seeds, pine nuts, croutons, heavy cream… I chose fresh crumbled goat cheese, olive oil and a hint of pepper. Yum! It’s Freezing cold here in Philly! The city’s covered in snow and school even got cancelled because of the harsh weather forecast. At lunch time, I found myself searching through my pantry, as going grocery shopping was not an option. I couldn’t even imagine braving the snow storm and the cold. This salad came together beautifully and really lifted my spirits up. It’s pretty, full of colors and flavors, and the lemon-dijon dressing really steals the show! Though it requires a bit of prep time, it’s nothing too complicated. My technique is actually to roast a bunch of veggies on the weekends when I have more time, and store them in my fridge for the week. That way, I can always grab them and add them to all my dishes in minutes. Bon Appétit! Prep Time: 40 min from scratch or 10 min with pre-roasted veggies. 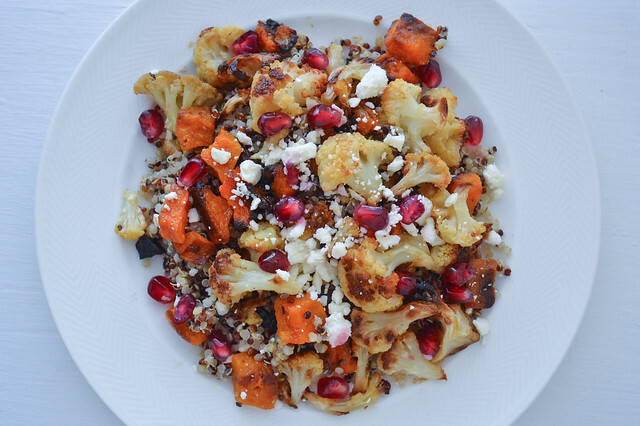 If you haven’t done so already, roast the cauliflower and butternut squash with olive oil and salt, at 400°F, for about 30 minutes in the oven. Meanwhile, cook the 1/4 cup of dried quinoa in a pot with about 1/2 cup of water. Start to make the dressing by mixing the mustard with the lemon juice. Then add the olive oil, the yogurt, and the spices to taste, while you’re still mixing. When the quinoa is cooked (about 20 minutes) set aside to let it cool until the veggies are roasted. 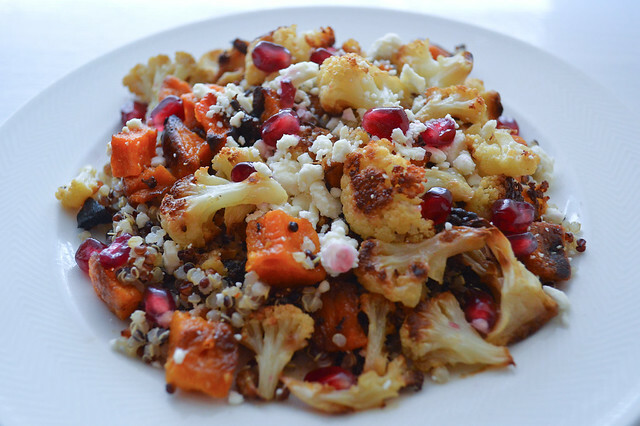 In a bowl, put the quinoa, roasted veggies, pomegranate seeds and crumbled feta. Drizzle with the lemon dijon dressing, toss gently, and enjoy! TIP: I like to mix the dressing with the quinoa first and then add the veggies, but that’s totally up to you! In case you didn’t know: I love soup! I can literally eat it every single day without getting tired of it. 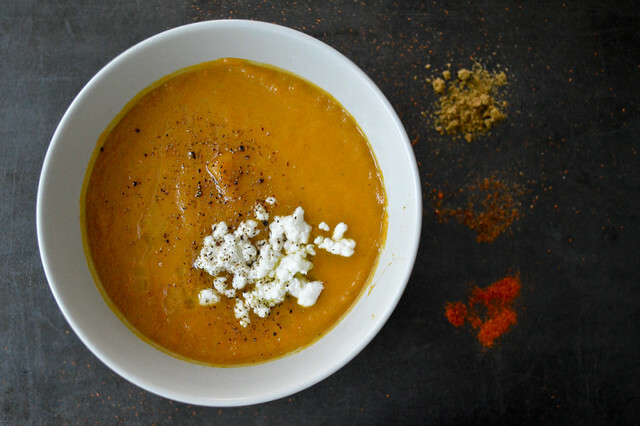 There are just so many things you can do with soup. Hot or cold, vegetarian or not, with or without noodles, creamy or chunky, broth or no broth, and so on… It’s amazing how versatile it is. Now, one of my favorite types of soup is called gazpacho. For those of you who have never tried it before, it’s a cold vegetable soup from Spain, usually with a tomato base (but not always). Though it’s mostly popular in the summer, I like it all year long because it’s tasty, fresh, and it requires a minimal amount of work! Don’t fear the “long” list of ingredients as they’re all really common vegetables. Bon appétit! Preheat the oven to 400°F, and roast the bell peppers for 20 minutes, or until their skin is blistered. Meanwhile, soak the bread in the water. Peal and dice the tomatoes, cucumber, onion, garlic, and roasted peppers (under cold water if too hot). Put all these vegetables, and the soaked bread and water in a blender. Add the oil, vinegar, Sriracha, spices and lemon juice and blend until smooth. That’s it! TIP: you can top each bowl with olive oil, roasted pine nuts, fresh basil, goat cheese, croutons, fresh diced cucumbers or anything else!